I do enjoy a game that leaves you to work things out for yourself. 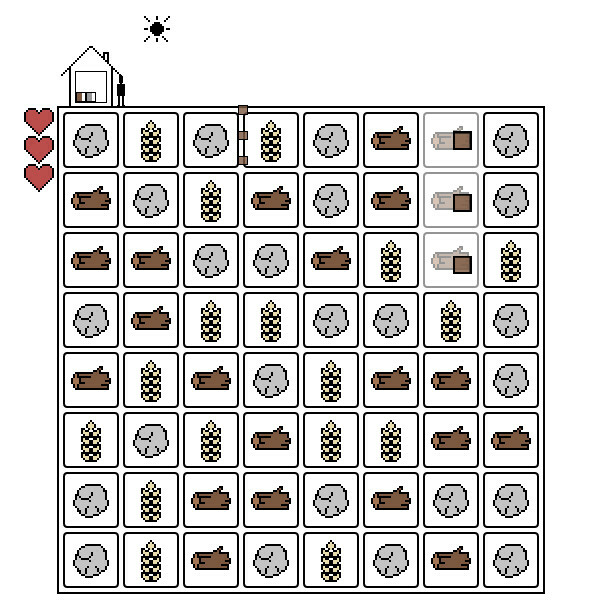 Gridland , desciribed by Doublespeak Games as “a weird little time-waster”, appears to be a fairly ordinary match-three sort of puzzle game, like ZooKeeper or, if you must, Bejeweled. You click on a pair of adjacent items to swap their positions, and if by doing so you create a line of three or more identical items, they’re removed and more drop down to replace them. The idea’s usually to collect a certain number of items before time runs out; in Gridland, however, there’s a little more to it than that. At the top of the area a little man walks up and down collecting your items from a storehouse, then uses them to build some sort of settlement. An interesting twist! And then the screen suddenly turns black and all the items change into something else. Now, if you’re me, you just carry on focusing on matching up rows of items and you don’t pay much attention to what’s happening at the top. Which, it turns out, is the worst thing you can do. 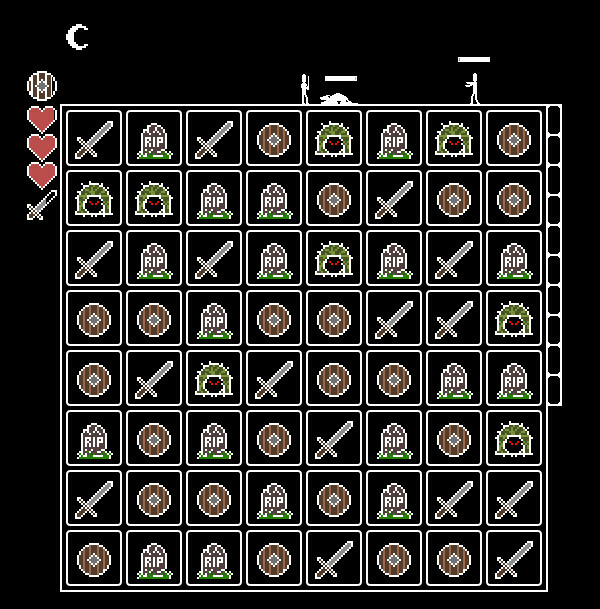 In this night-time section of the game you’re fighting for survival, and to do that you need a sword and a shield, acquired by lining up rows of the requisite items. 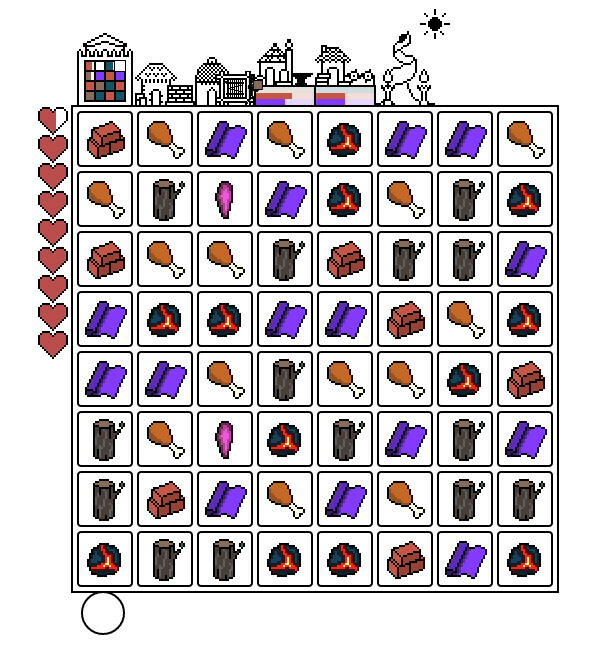 The other items cause enemies to spawn; fighting them wears down your sword and shield, and you need to keep them topped up by lining up more rows of them, otherwise you’ll end up dead, which means being dropped back to the beginning of the day. 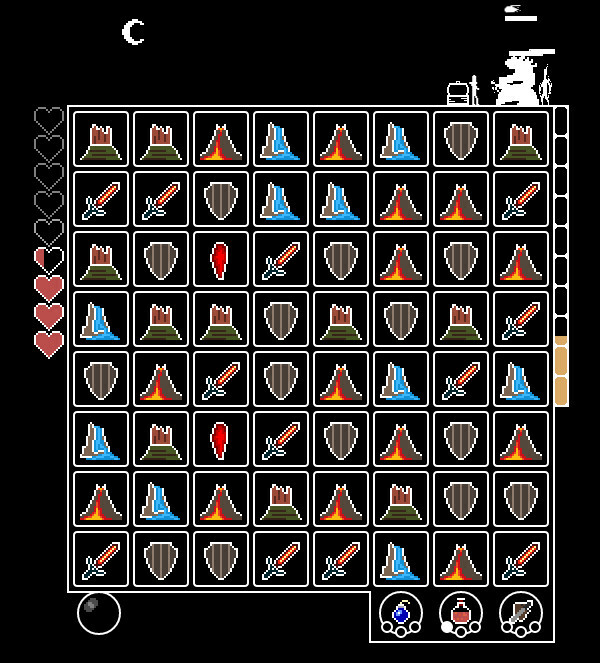 It’s tempting to assume that you could simply survive the night by not clicking on anything; I tried it, and that’s when I realised that you’re not really playing against the clock. A little sun (or moon) crosses the top of the screen as you play, but it moves as you move; you can’t just sit and wait for it. Which adds a whole strategic element to Gridland; I went in assuming that I was playing against an ever-ticking clock because, you know, that’s how you play these games. In fact I could play less frantically and plan my moves at a more leisurely pace. Except that never really pans out at night, because one move can trigger a whole chain of matched rows that can quickly lead to a horde of monsters and sudden death. Oh, it’s clever. And as the game progresses new items appear, or old ones suddenly upgrade into new ones, and as the days progress your little man works on building a bigger and better settlement, towards what aim I’m not at all sure; so far I’ve reached day 30 and there’s some interesting construction going on, as well as some serious night horrors. The really great thing? Gridland tells you absolutely nothing; it starts with the assumption that you know how to play a match-three puzzle game and then dicks around with your assumptions, trusting that you’ll figure everything out for yourself. I love it when a game has the confidence to do that, instead of smothering you with instructions and tutorials and hints. I’m still not entirely sure what I’m doing, but I’m getting there, and it’s a lot more rewarding to have figured this stuff out rather than have it spoon-fed to me. You can play it now in your browser, in the knowledge that it’ll save your progress as you go, enabling to close the browser and come back to it later. It’d be nice to see it in app form, though.